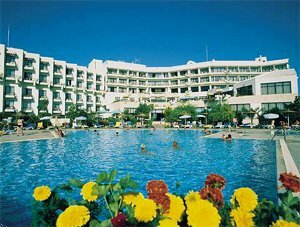 The Venus Beach Hotel is ideally located close to the Tombs of the Kings, perhaps the most important historical ancient site in Cyprus. It is also within easy reach of the tourist centre of Paphos making its location ideal for a truly relaxing sightseeing holiday. The hotel has been constructed with service and client comfort at the forefront of its unique design, and nothing has been spared to make your stay as carefree and relaxing as possible. A variety of restaurants offer a wide range of choice for an incredible array of daytime and night time dining experiences. The property features 182 rooms which all offer an impressive array of amenities and are decorated to the highest standard. The facilities of the hotel are extensive. The large free form outdoor swimming pool is ideal for relaxing with drinks served at the pool bar, and for those that want to get out of the Cypriot sun there is even an impressive indoor pool. For children there is a separate childrens paddling pool as well as amusement games, table tennis and pool tables. For the more active there are 2 floodlit tennis courts and a full gymnasium available for guests. Hotel guests can also enjoy the facilities of the hotels sauna, solarium and massage treatments for a truly relaxing experience. When it comes to dining, the hotel has some of the best restaurants and bars in the area, along with the Ariadne dining room with themed buffet evenings and set menus, there is an a la carte menu available, breakfast room, cocktail bar and poolside bar. The hotel hosts regular evening entertainment including Cypriot nights and live music. With the vast array of facilities and its fantastic beachfront location the Venus Beach Hotel is an incredible 5 star property and a first class holiday choice. All restaurants are fully non-smoking and indoors. Restaurant terraces operate seasonally, serving meals al fresco. Smart casual dress code is required as minimum, when dining in the Ariadne Dining Room. Adonis Room Length - 9 Meters Width - 6 Meters Height - 4 Meters Maximum Theater Style Capacity - 40 Maximum Classroom Style Capacity - 25 Maximum Cocktail Style Capacity - 40 Meeting rooms do not have windows for natural daylight. Description Technical equipment Audio and Visual Sound system Speech intercom, 2 way Amplifiers, Tape decks and playback Overhead projectors 3mm and screens 16mm sound and motion film projectors 35mm carousel automatic slide projectors Roll-up portable screens 1.60X1.60, 1.95X1.95 Large screen TV Videos and large screen video projector Lectern with light Flipcharts Illumination Ceiling spotlights 250w or 500w depending on requirements Apollo Room Length - 13 Meters Width - 7 Meters Height - 4 Meters Maximum Theater Style Capacity - 120 Maximum Classroom Style Capacity - 55 Maximum Cocktail Style Capacity - 120 Meeting rooms do not have windows for natural daylight. Description Technical equipment Audio and Visual Sound system Speech intercom, 2 way Amplifiers, Tape decks and playback Overhead projectors 3mm and screens 16mm sound and motion film projectors 35mm carousel automatic slide projectors Roll-up portable screens 1.60X1.60, 1.95X1.95 Large screen TV Videos and large screen video projector Lectern with light Flipcharts Illumination Ceiling spotlights 250w or 500w depending on requirements Aphrodite Hall Length - 26 Meters Width - 13 Meters Height - 6 Meters Maximum Theater Style Capacity - 420 Maximum Classroom Style Capacity - 200 Maximum Cocktail Style Capacity - 430 Meeting rooms have windows for natural daylight that cannot be effectively blacked out. Description Technical equipment Audio and Visual Sound system Speech intercom, 2 way Amplifiers, Tape decks and playback Overhead projectors 3mm and screens 16mm sound and motion film projectors 35mm carousel automatic slide projectors Roll-up portable screens 1.60X1.60, 1.95X1.95 Large screen TV Videos and large screen video projector Lectern with light Flipcharts Illumination Ceiling spotlights 250w or 500w depending on requirements. Outdoor venues may accommodate up to 4,000 invitees for wedding receptions or similar large events.